Fitness Wearables: Is their growth in India sustainable? The big question – Will the foundation of healthcare, the doctor-patient interaction, change? The answer to this question is 'Yes' and the catalyst for this change is the 'Wearable Device'. A wearable device is a technology worn on the human body. It is used for tracking a user's vital signs or pieces of data related to health and fitness. Wearable devices range from smart glasses to watches, bands to patches, clothes to shoes or even technology embedded in the skin. As we move towards a more technology oriented world and improved connectivity, these devices are expected to be ubiquitous. Though these devices are gaining popularity globally, with certain segments of population such as the fitness-oriented consumer, the market within India is still at a nascent stage. While the products have potential for applications across a wide variety of sectors and to cover a wide range of solutions, the difficulty of changing consumer mindsets and perceptions remains. Based on our research, the fitness wearable industry in India grew at a CAGR of 75-100% over the past couple of years. More than 2 million units were sold and they accounted for ₹ 400-500 Cr. in terms of revenue. Experts in the industry also feel that there is still a lot of momentum in the industry and that the industry will be able to sustain this level of growth over the coming years as well. 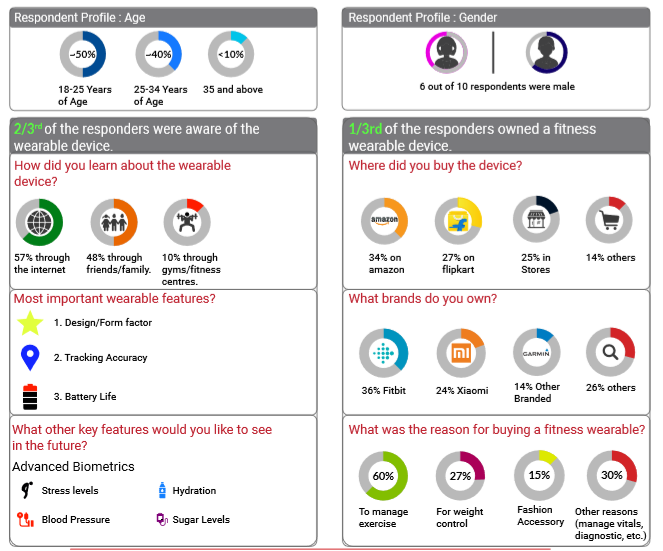 A recent survey conducted by RedSeer Consulting to understand the customer perceptions, purchase and usage patterns for fitness wearable devices yielded the following high-level findings. Internet remains a key influencer currently in the purchase decision for wearable devices, with friends and word-of-mouth propagation coming in a close second. Currently, with the market still in nascency, this trend is expected to continue. The online e-commerce platforms such as Flipkart and amazon are the most preferred selling channels in India. The share of online channel is estimated to be as high as 80% of the total fitness wearable device market. However, as the industry progresses from the development phase to the growth phase, the share of offline channel is expected to pick up. Fitbit and Xiaomi are the only brands to have some brand recognition within the marketplace, especially in the higher price range. In the lower-end of the spectrum, the market is flooded by a number of cheaper Chinese imports, which makes entry for newer players difficult without investing in marketing efforts. While current generation of devices are largely used for weight control and helping track exercise schedules, the future of the device lies in advanced biometrics, especially with demand for greater accuracy devices which also support multi-functional tracking including Hydration, Blood Sugar levels and even stress patterns.